I have been involved with horses for most of my life. There is a cliché that plays over in my head from the movie “The Horse Whisperer.” During one scene, Robert Redford says, “These people don’t have a horse problem… what we have is a horse with a people problem.” When I witness all the pump problems in the field that are directly caused by misalignment issues, I think about this cliché over and over and think to myself, it is not the pump’s fault. With an increasing and somewhat alarming frequency, I consult with end users who assume their new pump is perfectly aligned to the driver, so they do not align prior to startup. Just plug it in and run it, is the new modus operandi. Later when the real and expensive pump problems appear and I point out that the issues are caused by a bad alignment, the end user questions, “Why wasn’t this performed at the factory?” Spoiler alert, it was done at the factory, albeit not a precision alignment and the driver has since moved for a multitude of reasons. I strongly recommend that a pump be aligned at least seven to nine times, and four of those checks should be before it is even started up. 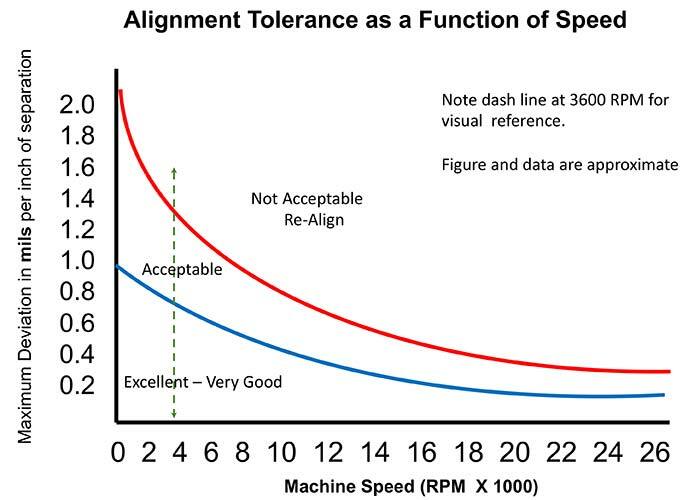 Rotating equipment experts and engineers that work at “best in class facilities” with equipment records reflecting high reliability and long mean time between failures (MTBF) will agree. This article is not a step-by-step procedure on how to accomplish the actual alignment; there are plenty of resources that can help you with that. The purpose of the article is to advise (and hopefully convince you) that, first, the alignment needs to be conducted several times over the course of installation and, secondly, of its importance. Why Spend the Time to Perform an Alignment? 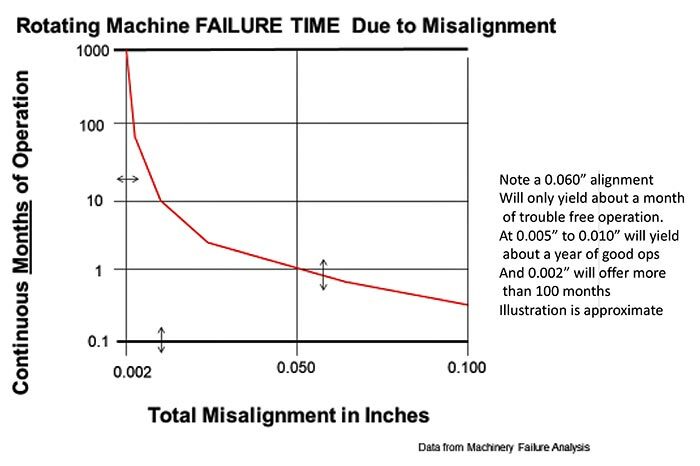 When you look at all the reasons why you should perform an alignment, you will find lists that cite shortened mechanical seal, bearing and coupling life, premature wear on the pump, unacceptable vibration, shaft failures, noise, inefficiency and associated additional power costs as the top reasons. But I would state all of these issues and more, including expensive and unscheduled downtime, all translate to the bottom line, which equal total cost. Noted rotating equipment engineer and author Heinz P. Bloch has conducted studies on pump reliability as it relates to alignment tolerance (see Image 1). Note that the more precise the alignment, the longer the unit will operate without any issues. Additionally, the faster the unit rotates, the more precise the alignment needs to be. See Image 2 for a graphic that provides a general guideline. Image 2. Precise alignment will help the unit operate without issues. When I tell people that they should align the pump nine times, I get some funny looks, but first let me explain. When the pump is at the factory, typically the driver is placed on the base and a “rough alignment” is conducted to ensure the final precision alignment can be successfully conducted later in the field. There can be exceptions to this case, and it also depends on the type and size of driver. The rough alignment may only cover the side-to-side adjustments and not the vertical or angular offsets aspects, as those will be addressed in the field. No matter how precise the alignment conducted at the factory and how carefully the equipment is moved, the alignment will change in transit. When the pump and base are received at the site and initially set on the foundation, the next alignment should be conducted. It is critical that the alignment be conducted or checked prior to grouting or connecting the piping to the pump. Missing this step is a common and expensive mistake. After the base is grouted and cured, it is time to check the alignment once again. The process of grouting the base can often warp or move the base and offset the alignment. There is a large amount of heat involved when grout cures, as well as some expansion force that will potentially change your settings. Now that the base is properly grouted and the driver is aligned to the pump, it is time to bring the piping to the pump. Done correctly, connecting the piping to the pump should not alter the alignment. But from my five decades of field experience, this is the most common reason for the alignment to change and it introduces unwanted stresses to the pump. I could write an entire series of articles on stresses introduced to the pump by the piping and you would be bored to tears.